Preserving the Past into the Future. To preserve and protect the breeding of pure-bred Afghan Hounds and to do all possible to bring their natural qualities to perfection. To encourage the organization of independent local Afghan Hound Specialty Clubs in those areas where there are sufficient fanciers of the breed. 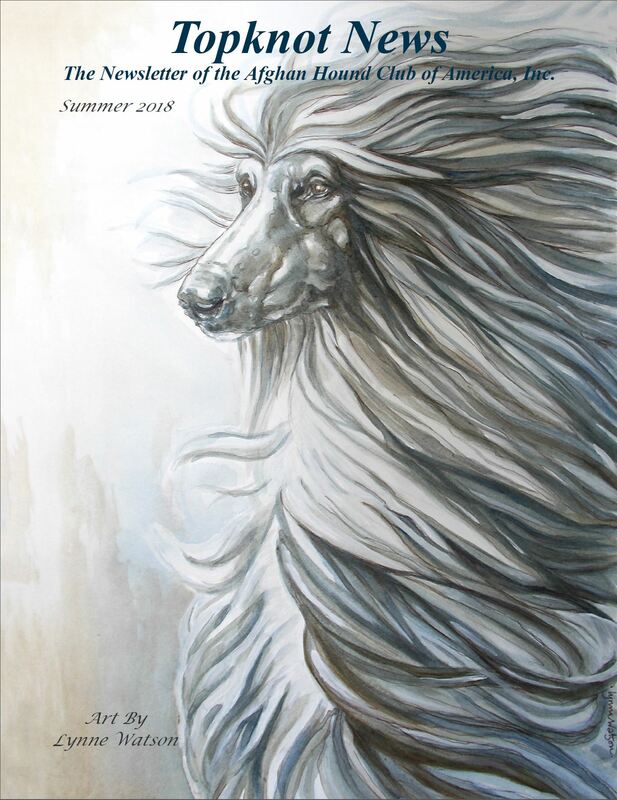 To urge members and breeders to be guided by the standard of the breed as approved by the American Kennel Club and to accept it as the only standard of excellence by which the Afghan Hound is to be judged. To do all in its power to protect and advance the interests of the Afghan Hound and to encourage sportsmanlike conduct at dog shows. To conduct sanctioned matches and specialty shows under the rules of the American Kennel Club. Join us in welcoming our newest members of the Afghan Hound Club of America and get to know them a bit. Pam adopted her first companion Afghan Hound, Rachel, in 1976. In 2012, "Chance" came to Pam from Anna Tyler, and Pam started showing in conformation and finished his Bronze Grand Champion Inisfree's Sirae Duet Leave It to Chance on her own. She also owns Inisfree Sirae Duet LyonHeart, "Trace," from Anna as well. Pam is very active in conformation as well as lure coursing with her Afghan Hounds. She recently co-bred her first litter with Anna Tyler and Cynthia Byington. 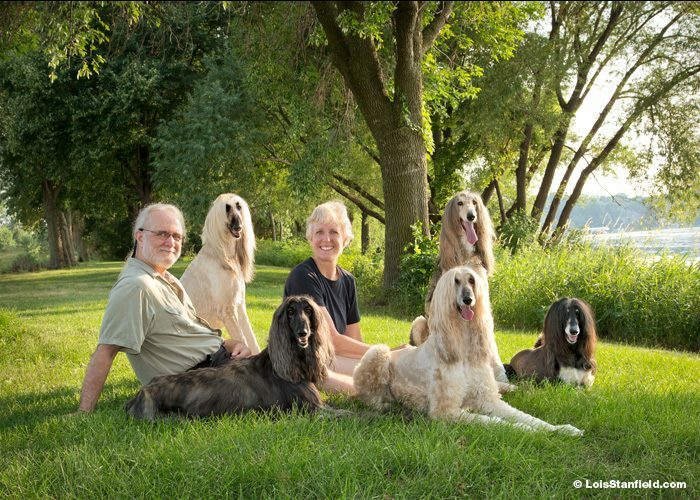 Pam is involved with the Greater Twin Cities Afghan Hound Club, taking parts in such activities as their Specialty, Sanctioned B Match, Lure Coursing, Trophies and Art Auction as well as the club's Performance Events with Lure Coursing, FastCAT and CAT's. Pam even created and donated the quilt to the AHCA which was raffled off at the 2004 AHCA National Specialty Awards Banquet! Dogs have been a large part of my life for as far back as I can remember. My grandparents bred and showed Chow Chows, and from an early age I began to show and care for the them as well. I now have 20+ years of confirmation and handling experience. My love for the Afghan Hound has always been strong and I acquired my first dog in 2006 from Lola Anderson. Lola was my first mentor in the breed and we are still close friends to this day. I pride myself in being an owner-handler. Since acquiring my first Afghan, I have finished six champions, two of which finished with specialty majors owner handled and one also being a UKC multiple Best In Show winner. I finished my Beauceron that I showed, owner-handled, to Award of Merit at Westminster. I have worked in veterinary medicine for over a decade as a technician. I am very passionate about health testing. CHIC numbers are a must for dogs in my household and are very beneficial for the breed as whole. I intend to contribute to the breed through public awareness and education, and show my passion and love for the breed by staying true to the breed standard. 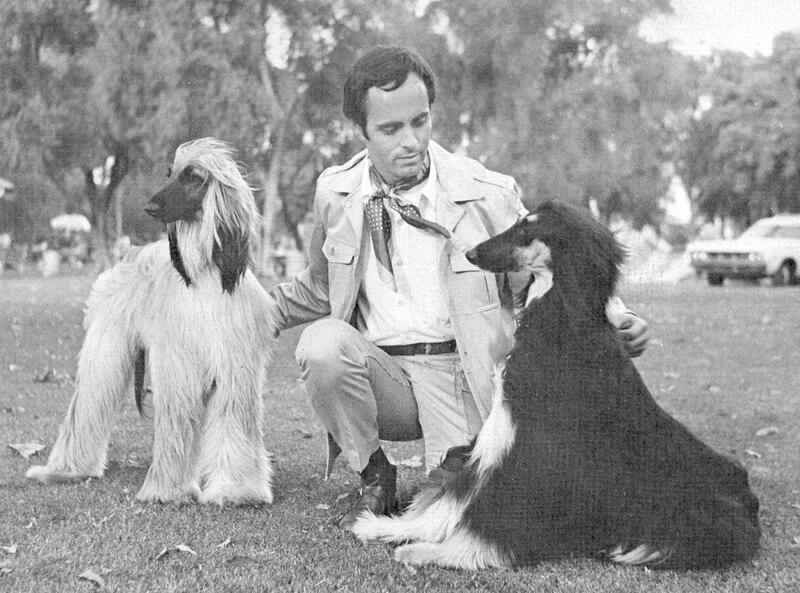 Richard Souza has been active in purebred dogs for over fifty years. In his primary breed, Afghan Hounds, he along with Mike Dunham as bred over eighty champions including two AHCA National Specialty B.I.S. winners, 15 individual Specialty B.I.S. winners and CHCoastwind Gazebo, the top Afghan Hound in the country for 1969-1970. In addition to being a National Specialty winner, B.I.S. CH Coastwind Abraxas, also broke the longstanding record for top producing sire held for many years by the great CH Shirkhanof Grandeur. Abraxas held that title for 20 years. 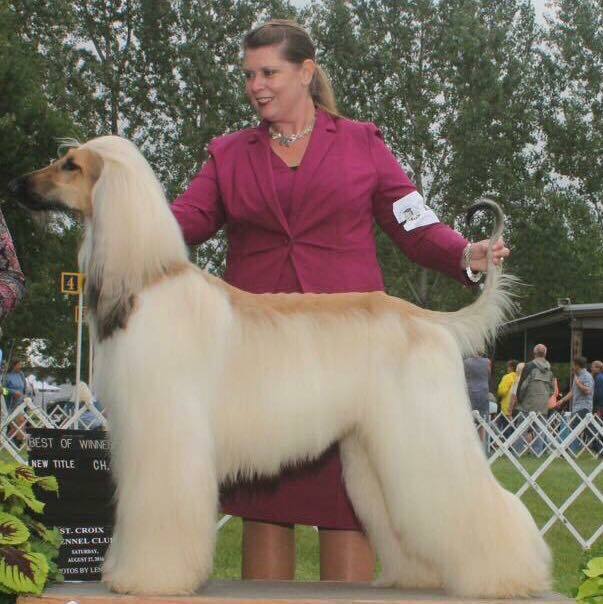 The siring power of the Coastwind stud force produced nearly 250 AKC Champions of record during that period in the breed often referred to as "The Golden Age of Afghan Hounds" - a time when breed entries and population were the highest on recordand remains unparalleled competition to the present day. Most American kennels today can boast of having Coastwind in their pedigrees. In other sighthound breeds, Mr. Souza has bred Saluki Champions, an all breed B.I.S. winning Whippet and a National Specialty winning Whippet. As a judge, Mr. Souza has had the privilege of evaluating and critiquing sighthounds in Germany, France, Spain, Sweden, Australia, South Africa, Canada, England and most recently the 2017 AHCA National Specialty. He is a founding member and past President of the Monterey Bay Afghan Hound Club and past Vice President and Show Chairman of Del Monte Kennel Club. We look forward to his involvement in the AHCA. Hi, I’m Karen Gresham, and I’m so happy to be a part of the AHCA. I began my love affair with this breed back in the Bicentennial year of 1976, when I saw a little apricot puppy girl in a pet shop window. (I didn’t know any better back then). Anyway, even though I was still an undergrad, I bought the little puppy and named her Arrow (from the‘Me and my Arrow” song). She was the love of my life, and she was SCENTED! A year later, I got her a friend, a black and tan girl named Sheba (Arlidaca’s Bathsheba). When I met my husband Bill in 1982, I had the 2 Affies and he had 2 mutleys and a cat. Quite a full house to start with! Anyway, once the (human) kids came along and the Affies passed, we “just” had long haired mini dachshies and mutleys for many years. Fast forward to 2009, and we were nearly dogless. Now was the time to go back to my first love….. so I drove to MD in the snow to get my cream baby LilliBelle (UKC CH. Chandhara’s The Wind in Her Hair). Lilli is a little temperamental, but she is an absolute love bug to those she knows well. That’s my story so far…. I’m a psychotherapist and Alistair is my co-therapist with most of my clients. Bill, Liili, Ali and I share our home in CT with an Afghan wanna-be named Bentley. Amy's first Afghan Hound was in 1988: CH Azlynn's Rasul of Anuttara FCh. 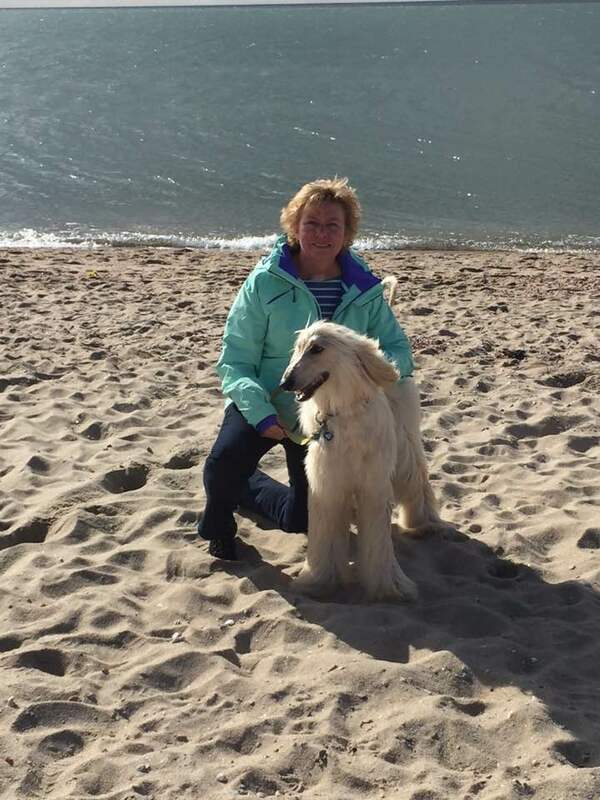 With over 30 years of experience, Amy hopes with her breeding program to perserve the very best in health, temperament, type and conformation. Amy credits some of her success to being lucky enough to experience an apprenticeship type relationship within the breed fancy, using this history and mindset to combine the best of our past, brought forward and combined with the new and fresh attitudes of our times. She has also contributed to rescue efforts over the years, taking in Afghan Hounds and all-breed dogs in need. Amy, with her experience and forward thinking, is sure to be a great addition to our club. 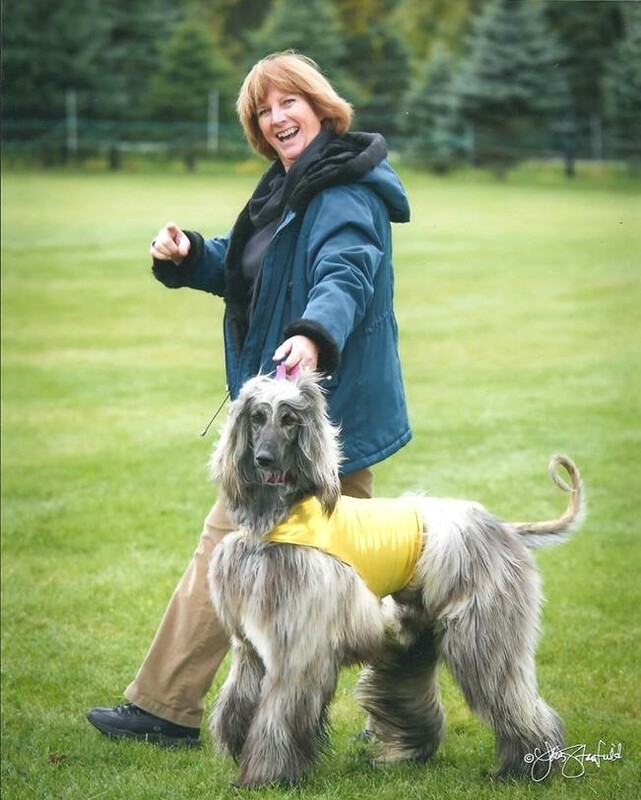 Louise Paulson bought her first Afghan Hound in 1989 and has been a member of the Greater Twin Cities Afghan Hound Club ever since, holding board positions, helping out with Specialties and Lure Coursing trials and has judged fun matches as well. She has been a breeder or co-breeder on many litters over the years producing a multitude of Champions and Dual Champions. In addition to conformation and lure coursing, she has been involved in Obedience and Agility, giving her Afghan Hounds many opportunities for socialization and positive activities. 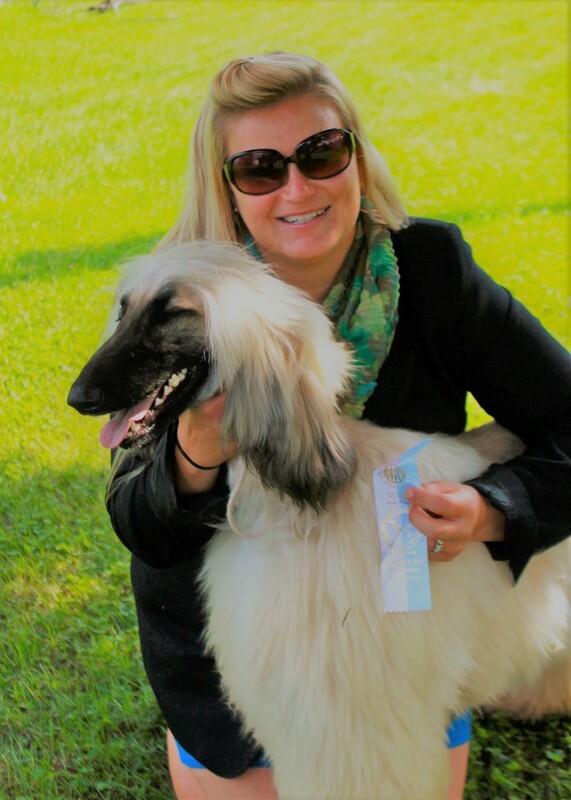 She hopes to continue to breed top-quality dogs with good temperaments who can be good ambassadors for the breed, and believes that exhibiting them outside of the show ring brings them to the attention of the public so they too can experience the fun and beauty of our breed. Her future plans include more involvement with the Conformation, Obedience, Agility and Lure Coursing aspects of our club, and we are definitely lucky to have such a versatile owner/breeder with well-rounded hounds as a member of our club! 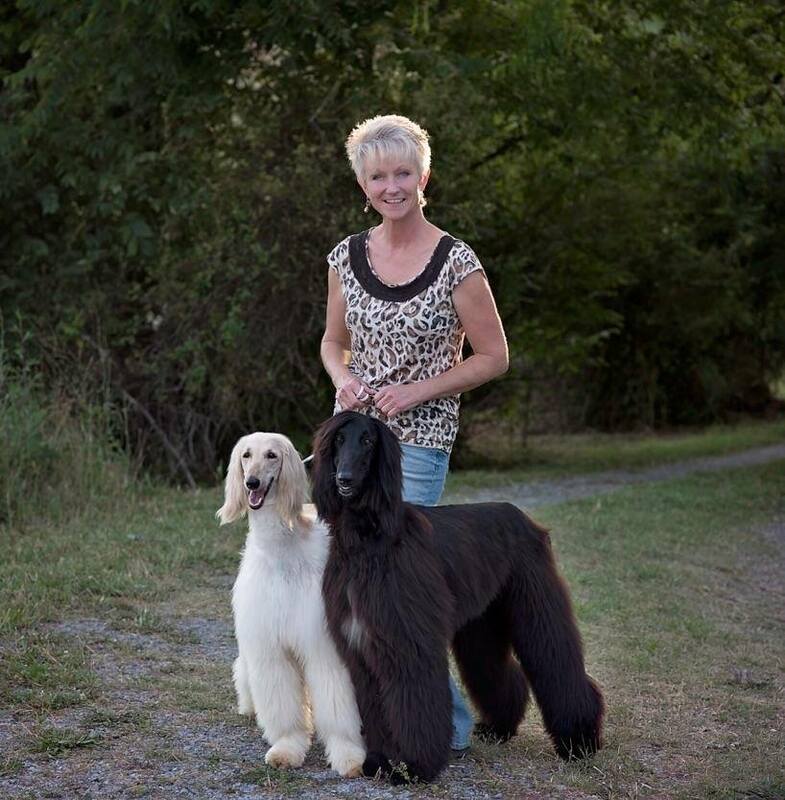 Kimberly started in Afghan Hounds in 1983 when her first puppy, Amber, was a wedding present from her husband. Since that time, she has owned and produced several litters with Grand Champions. 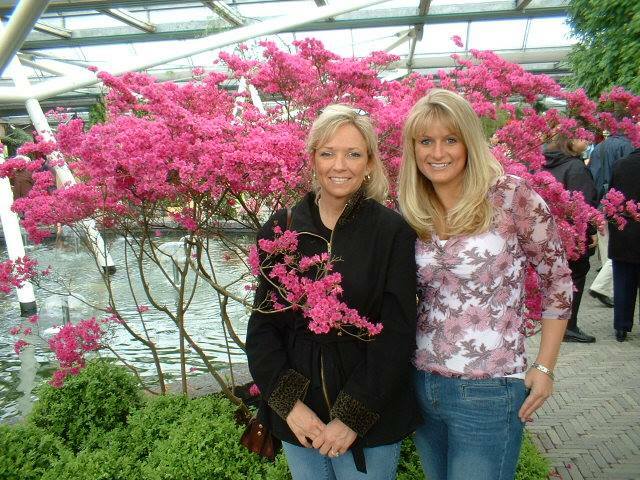 Kimberly loves showing and enjoys introducing newcomers to the breed and to the world of dog shows. She looks forward to working with the AHCA on our National Specialty and her compassionate and outgoing nature drives her to be involved with our hospitality and club communications committees. We are always happy to have such caring individuals as members of our club! Danielle, like many Junior Handlers in our breed, was born into Afghan Hounds. She's been around the breed and introduced to the show world and Juniors thanks to her mother and AHCA member, Kimberly Kurtz. She has been a co-breeder on two litters with her mother under the Winterberry kennel name. She plans on introducing her children to Junior Handling the future when they're old enough. In addition to her love of handling and grooming Afghan Hounds, she enjoys pedigree work and planning future litters with her family. We happy to have Danielle and her family as part of ours!